The holidays are coming. By the time you gobble up that last piece of Halloween candy it will be time to turn your attention to the coming holiday season. The weeks ahead could mean a whirlwind of shopping, baking, traveling and cleaning. There are a lot of things to coordinate especially if you have out-of-town guests coming in. This is why you want to get as much done as possible well in advance of those arriving guests so that you can actually enjoy the time with your friends and family. As you look around your home, you may notice there are a lot of things you could do without. 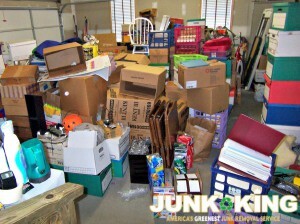 Junk King Atlanta is standing by to clear out your junk once and for all. You’ll probably notice the clutter as you go in search of your hollowing decorations. No doubt, what you put up for Halloween is kept stored next to all the Thanksgiving and Christmas decorations. But there could be a wall of rubbish between you and those decorations. It is amazing how quickly storage space fills up just in the course of one year. If you can make the determination that you will not be using any that clutter ever again, then there’s no reason to hold onto it. Junk King Atlanta can sweep in and in a few moments have it all loaded onto the back of their truck. It’s not just your storage areas that could benefit from decluttering but also the rest of your house. If your guestroom has become overrun with boxes, electronics and unwanted pieces of furniture, then you want to give that to Junk King as well. Always keep in mind that Junk King is going to provide you with your own working crew. This is the team that will do all the heavy lifting for you. That includes bringing down anything from upstairs. Just imagine what you can finally get rid of from the attic! The added benefit with hiring a company like Junk King Atlanta is how they dispose of the things they collect. They are dedicated to an eco-friendly way of getting rid of junk. That translates into recycling or donating the stuff you’re getting rid of. When you’re ready to make your home a junk free zone for the holidays, then Junk King Atlanta will be ready for you. This entry was posted in Atlanta Junk Removal and tagged holidays, junk free, Junk King, junk removal on October 22, 2017 by Junk King. Last updated October 22, 2017 .